The RTÉ website is the most visited site in Ireland, the Sunday Business Post says, with over 300,000 unique visitors a day in May. RAIDIÓ TEILIFÍS ÉIREANN is preparing to launch a defence of its website to an Oireachtas committee this Wednesday, after the committee was told by newspaper publishers the website was an abuse of its remit as a broadcaster. The National Newspapers of Ireland (NNI) told the Oireachtas Joint Committee on Communications, Energy and Natural Resources Debate last month that the RTÉ website, a commercial venture, was at odds with RTÉ’s role as a public service broadcaster, saying it was inappropriate for a service supplementary to RTÉ’s main role to earn advertising revenue for the broadcaster. The Sunday Business Post reports that RTÉ is to respond to those criticisms when the committee meets again this week, and that while the broadcaster will admit that newspapers face challenges in the transition to an environment with a greater focus on digital content, their own website does not play a significant role in the challenges. Instead, the paper says, they will argue that digital content is dominated by a small number of global companies. They will also present a document prepared by media consultants Amas, which is reported to conclude that Ireland’s three main newspaper groups did not invest in digital media to the scale they should have in the mid-1990s when they had the resources to do so. The NNI’s presentation last month advocated a reform of RTÉ’s online services to become more similar to those of the BBC, whose website is permitted to carry advertising only for overseas visitors to whom it does not have a public service obligation. Email “RTÉ prepares defence of website for Oireachtas committee”. 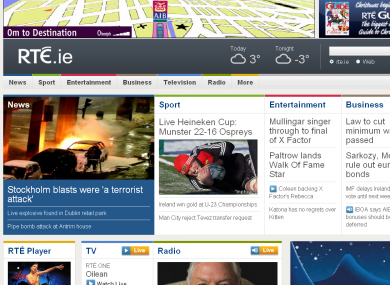 Feedback on “RTÉ prepares defence of website for Oireachtas committee”.